Hi everyone!! 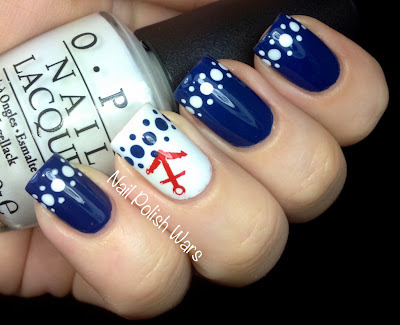 I was in my closet today and happened to notice a cute little navy blue dress with thin white horizontal strips, and it dawned on me that I haven't done a nautical mani in ages!! 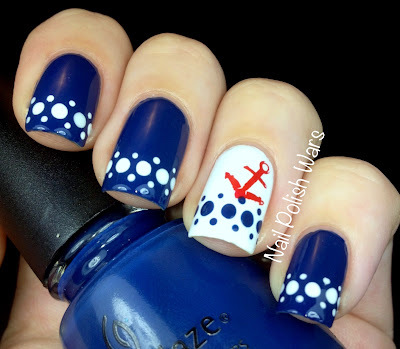 I stared off with two coats of China Glaze First Mate, a navy creme, and three coats of OPI My Boyfriend Scales Walls, a white creme with a grey undertone, to my ring fingers. I started to go with the traditional stripes! I had my tape all ready to go and everything. But then I thought about how many nautical manis I see with stripes, so I decided to go in a different direction. With my medium and small dotting tool, I used both First Mate and My Boyfriend Scales Walls to create the dotted line pattern. For a little something extra, I used Konad Special Red with Bundle Monster plate BM-08 for the anchor on my accent nails. I finished with one coat of Poshé. I hope you all enjoy this one!! Very cute! I never would have thought to use dots in a nautical mani. Genius!!! This is completely adorable! I like that you went with something other than stripes. So fun!! I love a nautical mani, so cute! This looks great! 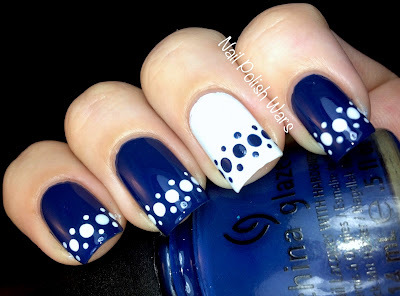 The dots are perfectly aligned!